The jury is still out on Pope Francis in a pontificate that may well be shaped by women. A month after Cardinal Jorge Mario Bergoglio was named Bishop of Rome, his Prefect of the Congregation for the Doctrine of the Faith, Most Rev. Gerhard Ludwig Mueller, met with the presidents of the Leadership Conference of Women Religious, an umbrella group of American nuns that had come under doctrinal scrutiny and been found wanting. Archbishop Mueller claimed that he had “recently discussed the Doctrinal Assessment with Pope Francis, who reaffirmed the findings of the Assessment and the program of reform for this Conference of Major Superiors.” On the face of it, this means that Archbishop J. Peter Sartain, Bishop Leonard P. Blair, and Bishop Thomas John Paprocki, who were named to enforce the terms the Congregation’s findings against the LCWR, are given carte blanche to do so. There may be more to this than meets the eye. LCWR’s statement on the meeting includes just the facts and a dignified conclusion: “The conversation was open and frank. We pray that these conversations may bear fruit for the good of the Church.” Pundits are left to parse the rest. It is early in a pontificate to make definitive judgments. Jesuits, I am informed, usually wait 100 days before making major decisions in their new positions. Perhaps Francis is observing the custom, hence some warrant for the bated-breath approach of some progressive pundits. As an inveterate pope watcher and advocate for justice for women, let me offer a few insights to guide future evaluation. First, the early impressions of Francis are positive on several fronts. His much vaunted simple lifestyle, his decision to live in community, wear black shoes, pay the hotel bill he owed, ride the cardinals’ bus, worry about the well-being of the Swiss Guards, and forsake the white ermine-collared mozzetta (part of the papal wardrobe) all stand in deep contrast to the customs of his immediate predecessor popes. Although a reasonable person might conclude that the bar is hopelessly low in this regard. In recent years, we were treated to cardinals wearing long trains (cappa magna). We endured stories of a sumptuous 80th birthday party for disgraced Boston Cardinal Bernard Law at one of Rome’s four-star restaurants. We know that Benedict and his colleagues were harsh on nuns whose lifestyles they would do well to emulate. I expect a good deal more from Francis than the friendly but still largely cosmetic changes he has instituted. Gradualists will disagree with me, but I think it is time for Catholics to grow up and realize that royalty does not become us. The church is a service organization whose primary stakeholders are people who are poor. Their needs, and not the whims of pampered prelates, are the priority. Nothing less is acceptable. Raise the bar for heaven’s sake. Second, on things that enthusiasts say are different in the months since the new pope took office: they are not all that different. Take, for example, the washing of two women’s feet at the Holy Thursday celebration. Granted, one of them was Muslim, and granted, the current pope may not be one for grand gestures (in which case they all would have been women in retribution), but is the liturgical act of washing two women out of 12 in 2000 years really the sign of the ‘feministization’ of the Roman Catholic Church? Not by my lights. Naming a committee of nine Cardinals to advise Pope Francis on reforming the Curia and administering an unwieldy bureaucracy is also touted as a big change. However, this sort of kitchen cabinet looks to me like a kind of steering committee of the cardinals, hardly a revolutionary idea. Note the lack of lay people, women, and, God-forbid, young people on the list. I am hard pressed to think that certain cardinals did not have a pope’s ear before this. The Vatican’s spokesman emphasized the advisory nature of the group, further assuring that nothing has really changed. I am getting ready to rest my case though I long to be proven wrong. 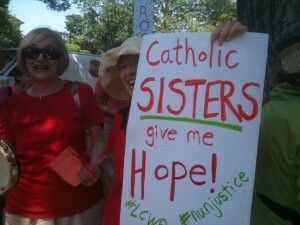 Third, the meeting with the LCWR presidents needs to be read critically in light of the theo-politics of the moment. I can imagine that the Archbishop Mueller’s of this world are scrambling to figure out where to go next. This is a crowd accustomed to taking orders from the top, and when they cannot be sure just what the top wants they must be very nervous. Nonetheless, I take the man at his word that he had some communication with the pope, which gave him the impression that it was fine to go full steam ahead with the hostile take-over of LCWR. What we do not know is the nature of the conversation. Maybe it was part of a long, soul-searching discussion into the wee hours of the morning by men who agonized over how to apologize sufficiently to the women for taking their time and impugning the reputations. More likely, it was a short, pedestrian mention by an overeager cleric who simply had to tell Su Santidad that he was planning to meet with the women. I can imagine that the Pope, distracted by concerns of poverty, ecocide, and war said “have a good meeting” which the Archbishop interpreted as license to continue with the oppression of women religious. Time will tell which it was, or something in between. For now, the bureaucracy grinds on with the women’s organization still under a cloud. More telling, perhaps, will be the action or lack of it against women religious more broadly. The doctrinal investigation of LCWR was insult, but injury came in the form of an Apostolic Visitation (something akin to a convening a grand jury with the presumption that something is wrong) of virtually all of the communities whose leaders belong to LCWR. A ray of hope is seen in the recent appointment of José Rodríguez Carballo, the leader of Franciscan men worldwide as the secretary of the Congregation for Institutes of Consecrated Life and Societies of Apostolic Life (memo to curial reformers: shorten the names of these outfits). That is the group that undertook the snooping into the lives and institutions of women religious. Archbishop Carballo, a member of a religious congregation himself, is expected to be a pastoral sort. But let optimists not pass over the fact that he serves under the Prefect Cardinal João Braz de Aviz who succeeded Cardinal Franc Rodé who started the whole operation. If the Vatican under Pope Francis is smart, they will conveniently forget that this unfortunate chapter of church history ever took place. If they are wise, they will thank Mother Mary Clare Mallia, A.S.C.J., and her collaborators who did their bidding and move on, and apologize to the women’s communities for intruding on their space and time. Then I will say there is hope for this papacy. But if LCWR is left to twist in the wind, if the rest of the active communities that were subject to the indignity of a visitation are left hanging, can we say this pope is different from any other pope? I urge that if women are not welcomed into all forms of ministry, decision making, and administration of the Roman Catholic Church in the very near future—I mean a year, max two, not a lifetime—then the jury find this pope as guilty as the rest in the ‘disappearance’ of half of the Catholic community. Maybe we will be surprised, and I will be the first one to rejoice that my skepticism was unwarranted. Meanwhile, as one who is not accustomed to drinking the Kool-Aid, I suggest that the nuns lawyer up and all Catholic women go on with our ministries as we have been doing for decades, as if nothing has happened.